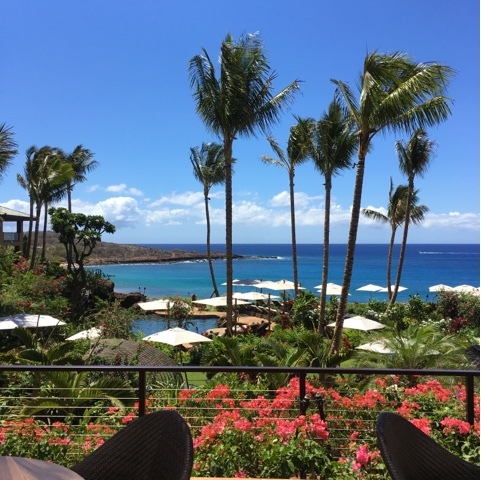 At the gorgeous Four Seasons Resort Lanai, you have a few options for breakfast. Besides in room dining, you can either pick up some grab and go items at Kope, located in the Sports Bar, or have a relaxing breakfast with an amazing ocean view at restaurant One Forty. The service from the beginning was stellar. When my husband asked if I wanted coffee and I hesitated because it was a hot day, our server immediately offered iced coffee. Genius! 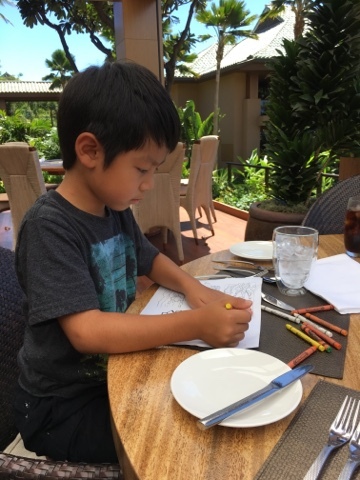 I also love that the resort caters to families because each restaurant on property offers a kids menu and coloring pages to keep them occupied. 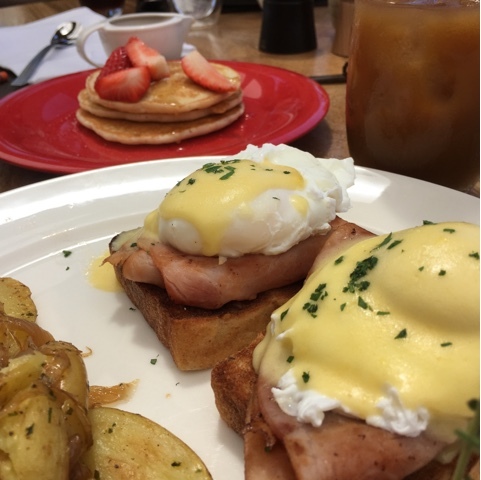 At One Forty, you can either order off the menu or choose their extensive breakfast buffet. I decided to order off the menu and had their unique Lana’i Eggs Benedict (Shaved Smoked Ham, Hollandaise Sauce, and Tomato Pineapple Chutney, served on a French Baguette). Absolutely delicious! I especially enjoyed the sweetness of the chutney in this savory dish. 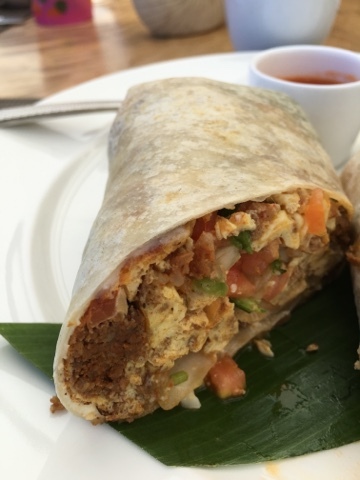 My husband chose the Breakfast Burrito (Scrambled Eggs, Chorizo, Spinach, Cilantro, Cheddar Cheese, Cotija Cheese, Spanish Rice, Sour Cream, Guacamole, and One Forty Lava Sauce) and also really liked it. The burrito was huge which was great because once my son got a bite, he kept asking for more. One Forty serves breakfast daily from 6:30am to 11am and is located in the lower lobby in the Four Seasons Resort Lanai.